A client-side Mod so that Minecraft now natively supports Mumble's and TeamSpeak3's* positional audio feature. Requires Forge. Demo Videos here. There is none. You will need a separate Mumble Server (called Murmur). A really big Thank you to Windows9Fan for taking the time to give us this demonstration. put the "MumbleLink.jar" into your .minecraft/mods folder - DO NOT EXTRACT THE JAR! in Plugins section: find and enable "Link v1.2.0"
"zsawyer" is me on SourceForge and GitHub. I can't seem to stop working on this ... but don't rely on me giving you timely updates. theskorm has forked the sources. You can do so too! This diagram shows how this mod integrates with Mumble, Minecraft and their server equivalents. Instead of hearing people from indefinitely far away you can set up mumble to only hear them when they are close. In return you (and they!) will need to bind an extra key to communicate with those far away (imagine it being a "walkie-talkie" button). To set this up you will need to do some special settings which differ from the defaults, in return it might enhance your audio experience. Instruction video here, skip to 3:19. 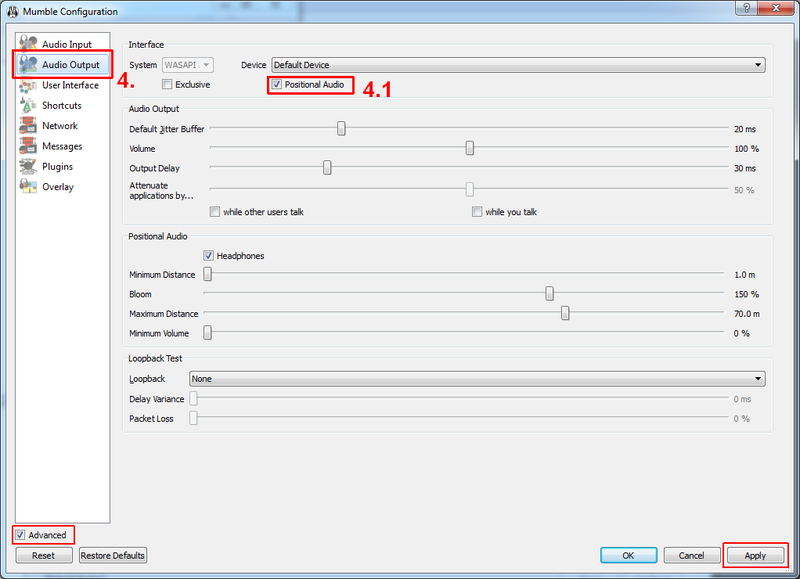 Audio Output section: disable "Attenuate applications by... " "while other users talk" and "while you talk"
bind a key ("Shortcut") to "Shout/Wisper" "Shout to Channel" select "Current" Channel and make sure to check "Ignore positional audio"
Please try to find the answer yourself: Read the README sections "Notes", "Troubleshooting" and "FAQ". Generally you are free to distribute it with your private (or public, or commercial) mod-packs as specified by LGPLv3. That being said, it virtually means no restrictions apply except that you should inform users that your mod-pack contains this mod and that it is licensed under LGPLv3. Feel free to drop a note and a link in this thread. It might give you some more users and I simply am curious to see where it is used (totally optional!). This project is licensed under the LGPLv3. Sources can be found on sourceforge in the SVN. Read the README.txt files in some of the folders for instructions. If you would like to help me out see if you can take on one or more of the TODOs or tickets. Please also refer to full changelog of v4.0.2 in the README and the source code comments. The interface "MumbleLinkAPI" allows your addon to inject their custom Mumble context and/or identity. Use this interface to register your callback function handlers. You will have to implement the callback interfaces. It is suggested that your addon implements the "Activatable" interface to allow other (child) addons to disable your handlers and thus overriding/replacing them. This is neccessary since the context and identity fields have a very limited length. The ExtendedPASupport mod should serve as a sample implementation. Please note the javadoc of these files. Minecraft in conjunction with Mumble's positional audio feature. It uses the Mumble Link Plugin v1.2.0 and adds native mumble support. Tested with Mumble 1.2.2 - 1.2.4 and PR_Mumble1.0 . It also uses JNA (https://github.com/twall/jna). (Configure -> Settings -> Tick "Advanced" -> "Plugins"
1. Close both Mumble and Minecraft. 2. in Plugins section: find and enable "Link v1.2.0"
3. replace the old MumbleLink-jar with the new one! defaults, in return it might enhance your audio experience. 3. 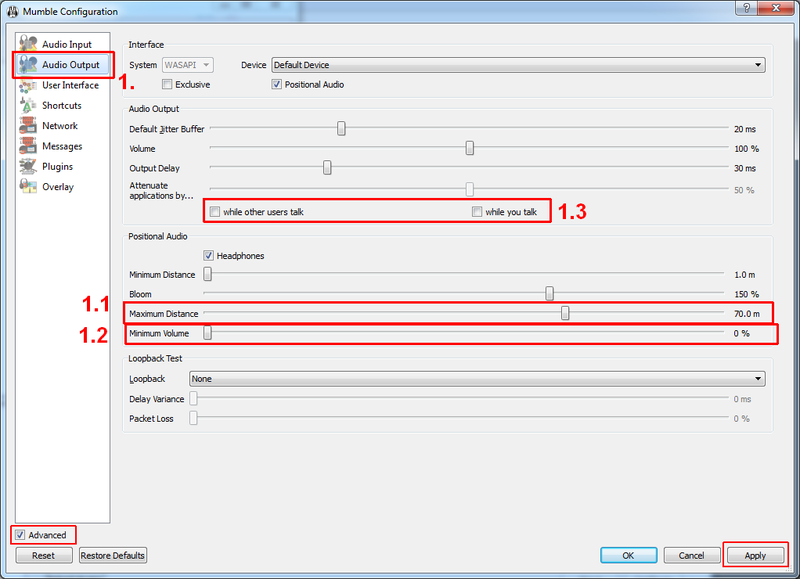 Audio Output section: disable "Attenuate applications by... " "while other users talk" and "while you talk"
1. bind a key ("Shortcut") to "Shout/Wisper" "Shout to Channel" select "Current" Channel and make sure to check "Ignore positional audio"
-- untick "Attenuate applications by..." "while other users talk" and "while you talk"
that the plugin linked can however show before the effect kicks in. - Please check the logs in your .minecraft-folder for an error message. - How do I know that I am linked/the mod works? - You are using an incompatible mod version. system is not supported by this mod. Sorry. - Mumble sais "Minecraft linked." but I still don't hear people positionally. 2. The others are not using this mod. Get them to install it! "Attenuate applications by..." "while other users talk"
- Please also refer to changelog of v4.0.2 and the source code comments. 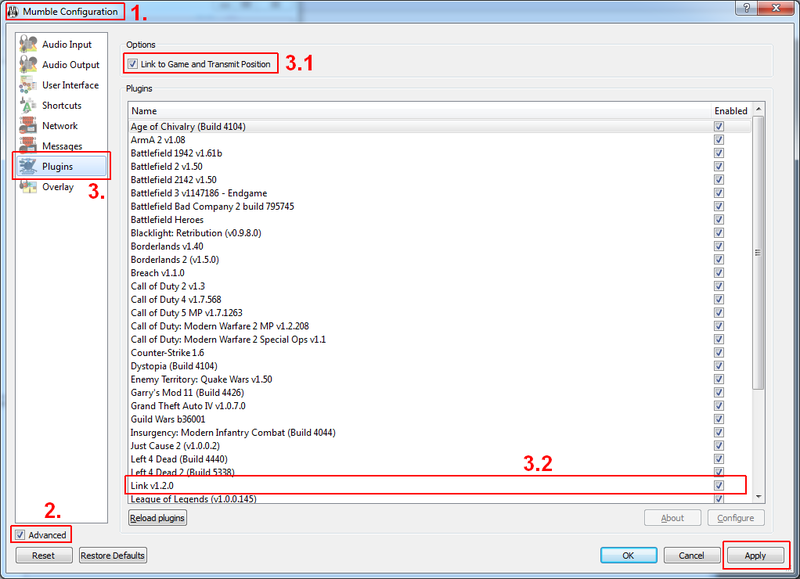 commercial) mod-packs as specified by LGPLv3. it is licensed under LGPLv3. - Feel free to drop a note on the forum that your pack contains this mod. where it is used (totally optional!). - Does not work with MicDoodleCore. Libraries will not be loading properly. A workaround is described in the forum thread. will be done using GitHub but the distribution is done through SourceForge. TheSkorm has forked this Project (v2.3.3, r72). Mumble Team : Thanks for Mumble! Mojang : Thanks for Minecraft! The MCP Team : Thanks for Minecraft Coder Pack! Forge Team : Thanks for Forge! AbrarSyed : Thanks for ForgeGradle! SilentWalker : Thanks for testing on XP64, Ubuntu32 and other invaluable support. twall : Thanks for JNA! IMPORTANT: mod_MumbleLink with differing major version numbers are not compatible! You will not hear people with vX... positionally if you are using vY... (and vise-versa)! You can find all previous official releases at https://sourceforge....mblelink/files/! NOTICE: Some files are provided as courtesy by other users. Therefore I cannot vouch for their validity. Use at own risk! This link always contains theskorm's latest version. Please refer to the README.txt within the zip. Are you zsawyer and did you create this Mod? If not, I don't believe you are allowed to "release" this. Not entirely true, if he isn't zsawyer he could have obtained permission to make this thread. I do hope he has permission or he is zsawyer, because this is awesome on so many levels. Yes, that is me on sourceforge. Tried to clear that up in the initial post. I am glad you like this project. I regularly host an SMP server, have just set up a Mumble server for it, and will be testing this out as soon as I get the mod installed. I'll report on it, but just letting you know: This mod is awesome! I've been wanting to see this done with Minecraft ever since, well, CMP haha. Thanks so much for your effort and work in creating it for us all =P. Mumble is a voice chat program much like TeamSpeak, and is often used with servers in the same manner. However, Mumble comes with a special feature, called positional voice chat, in which other players' voices are attenuated according to their distance and direction from you, but it only works if the game supports it. 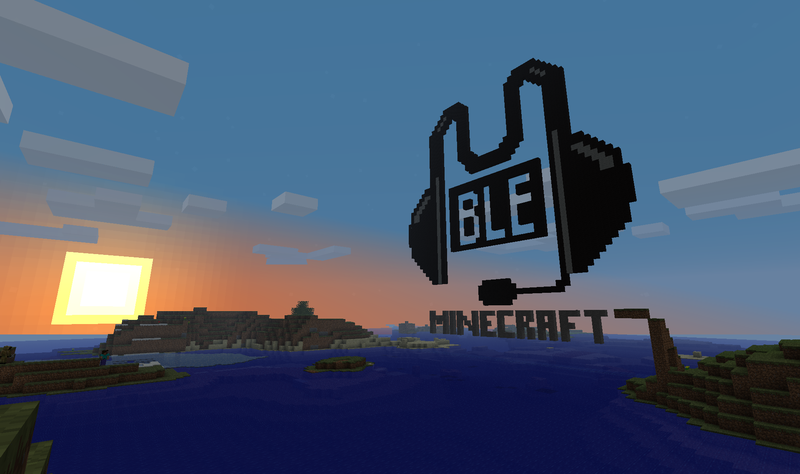 This mod allows Mumble's positional voice chat feature to work with Minecraft. This mod seems to be incompatible with Optimine. I installed one mod at a time with this and mod loader in it and tested, once I put Optimine in I got a black screen on start up. Seems like a great mod though, I'm looking forward to using it. Just waiting for someone else to get it installed without a black screen so we can see if it works. Alright, got my buddy Clash there and I together. Unfortunately, we can't get the positional audio attenuation to work. Is there something we're missing, maybe? Unfortunately this single entry is insufficient for debugging. That line will always be there when using 64-bit Java because the 32-bit library is always attempted to be loaded first. A fallback procedure will then attempt to load the 64-bit DLL. v1.0 does not support 64-Bit Java please use v1.1 instead. If you still have problems please provide the full ModLoader.txt file. Been having a lot of fun with this mod. I highly recommend it! There is a side effect though that people begin spontaneously RPing and/or speaking with accents. Haven't figured that one out yet. It's there, you just missed it =P. He doesn't really tell you where to find it, though, so it's a little confusing. Under configure > settings, and with Advanced ticked, it's the top and only check box under the plugins menu. Yeah I guess I was kind of lazy there... sry. PS: I'll try to clean up the Warnings in the next release. They are quite misleading. THIS VERSION IS EXPERIMENTAL! Please provide feedback when using it - thank you. Note: Compiled under Ubuntu 10.10 - so it should work there. This is great thank you! (added it to the main post).